I know this quilt looks like it is made of Bear's Paw blocks, but really it's just one big block... it is called the Wedding March block. Cool, huh! With the high contrast between the lovely light prints and those stunning mediums and darks, I thought it was the perfect fit for this quilt. Large and small half square triangles are all that is required. Helpful piecing and pressing hints make construction a breeze. The quilt was named for my paternal grandmother, Rose. I don't know if she had a wild side, but what I remember most is that she was never without a coffee cake. Oh how she loved her sweets! Grandma, I think I get that from you! Sweet Rosie was made using 2 charm packs from the Wildrose collection by Brannock & Patek for Moda Fabrics. Any charm pack(s) with 19 medium/darks and 19 light prints will work. 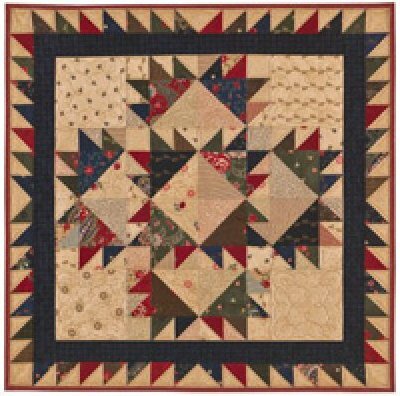 Quilt measures approximately 24" x 24".